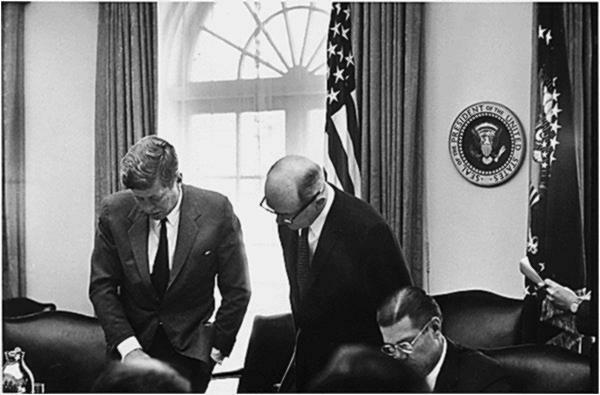 John F. Kennedy's response to the Cuban missile crisis has become one of the icons of the Cold War. The film 13 days captures it well: Kennedy stood against the Chiefs of the Defence staff, along with his staff, and argued against an invasion of Cuba. At the last moment, the Americans received two messages from the Soviet leadership: in one the Soviets wrote that they did not want to go to war and asked the US for a guarantee of Cuban independence- after which they would withdraw their missiles. The next day, before the US had a chance to respond, the Soviets issued a second message over Moscow radio: this public offer was for a trade, Soviet missiles would leave Cuba if the Americans would withdraw their missiles from Turkey. On the night of the 27th, Kennedy and his colleagues came to a decision: they stood resolute and decided that they would ignore the second message, and respond to the first- they responded and the Russians decided to leave Cuba. This account is now under serious attack from historians: most notably Sheldon M. Stern who works on the papers surrounding the Cuban missile crisis. Stern's arguments are based on the transcripts of the Excomm meetings in October and November 1962. They are interesting I think because they reveal something about the crisis and about the nature of memory. Stern's vision of the crisis sees JFK much more on his own: arguing not just against his military men, but also against people that previously we've seen as his supporters- people like his brother Robert Kennedy or his Defence Secretary Robert McNamara. Dean Rusk emerges in Stern's story as a far more important character than in the conventional story. Of course the difference between the two, according to Stern, comes down to the sources that they are using. Stern uses the actual words that were spoken- whereas most modern historians have relied upon the accounts from Robert Kennedy and others of those conversations. The differences between the two are fascinating: because they imply to me at least that the entire fabric of who took the decision, who said what and what was said is wrong. Stern argues that some of this is down to lying: Robert Kennedy wanted to sell an image of himself in 1968 as a conciliator who would oppose Vietnam. Robert Mcnamara comes through Stern's book as one of the most Machiavellian operators of all, concerned with preserving his own image. Both reflected that those outside the Kennedy circle- Ambassador Adlai Stevenson or Secretary of State Rusk were insignificant. Neither wanted to acknowledge a difference with John Kennedy himself. That seems plausible to me as an account of why they might have construed the story- but I think it misses something important. The story that Stern tells is not one that is completely straightforward: he shows that members of the committee veered all over the place during their high level discussions. Rusk for instance advocated both invasion and conciliation. You would expect this- they were under massive stress. It is natural therefore that when politicians came to write their memoirs- they made the process look simpler and more straightforward and they also remembered the attitude they had taken that had turned out correctly. Stern also suggests that the denouement of the crisis was diametrically opposed to the conventional account. Far from rejecting the second letter, Kennedy rejected the first letter and went to negotiate on the back of the second. The outcome- that America secretly withdrew its missiles from Turkey in exchange for a Soviet withdrawal from Cuba- might look the same but the clever acceptance of the first letter never happened. This is not a field that I am in any way expert on- and the reasons he gives for the US initial position on this (the lie about the letters) is important: Kennedy wanted to win the midterms and not to be seen to be soft on communism. Again though one wonders about the quality of memory- once you start repeating a story, does it become your story, once you start creating history, does it become history? The Cuban missile crisis is something that occurred relatively recently: and yet its only due to the existence of these tapes that historians and others have not, according to Stern, made a major mistake about the course of the crisis. That makes me reflect upon the other events that we may have got wrong. We don't have tapes for most of the crucial meetings of history: but if McNamara and Sorenson and Kennedy got the meetings of Excomm wrong, how likely is it that others back in the past recorded their meetings inaccurately? How sceptical should we be about our own sources? How sceptical about our own memories?